Macoscope’s Circuloid app for iPhone is a super addictive brick-breaker game that puts a new spin on this classic–almost literally. Where the traditional brick-breaker game is confined to the four sides of the screen, Circuloid puts a circle around the bricks, requiring you to approach the game from every possible angle. Play as John Circuloid, a former white-collar worker turned secret agent, and work your way up from a wet-behind-the-ears newbie to a real spy. Circuloid’s main screen is like the desk of a secret agent: a top secret file folder, old-school beeper, 3.5 floppy disk, and a supply of toothpicks are displayed. The top secret file folder contains your missions. Tap on the beeper to receive messages from your boss. Before beginning your missions, you may choose from three different control modes under settings: Touch, Slider and Accelerometer. Touch allows you to rotate the paddles around with the bricks with your finger. If you don’t want to move your finger all over the screen, then Slide will allow you to control the direction of the paddles with an up or down swipe. Accelerometer mode allows you to tilt your device left or right to rotate the paddles. 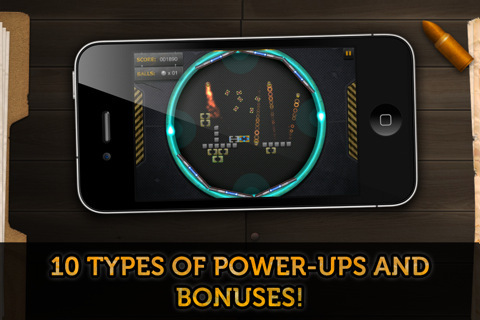 Once you’ve decided which control mode best suits you, tap on Play to start your first mission. Like with the traditional brick-breaker game, the objective of Circuloid is to destroy all the bricks on the screen with a ball bounced by a paddle. You must also make sure the ball never falls outside the boundaries of the screen. If this happens, you lose a life or even end up game over. You can gain an advantage in the game by collecting 10 different power-ups and bonuses that are freed when you destroy certain bricks. These power-ups can give you extra lives or change the speed of the ball. Once you’ve destroyed all the bricks on the screen, you move onto the next level. 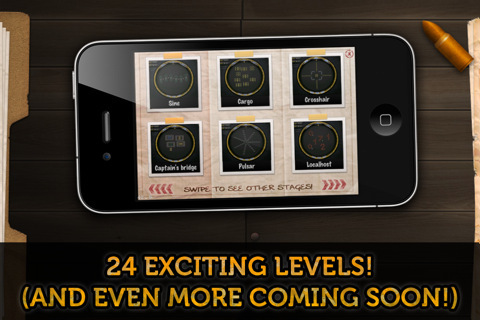 With 24 levels–and promises of more to come by the creators–the game is full of replay potential. High scores are saved, allowing you to go back to old missions and attempt to beat those scores when you’ve gotten better at at the game. Circuloid’s graphics and art is pretty impressive. Based on a space industrial theme, the background is composed of steel plates with black and yellow caution strips on the side of the screen. Mission names such as Captain’s Bridge and Pulsar only add to the futuristic feeling of the game. The graphics are sharp and the colors are nice blend of the murkiness of space with the brightness of technology every time the ball or the circle enclosing the bricks light up as you play. The music is a head-nodding synth beat that matches the secret agent storyline of the game. As a fan of brick-breaker, I love Circuloid. Putting a circle around the bricks rather than bouncing them off the four sides of a square screen creates a new challenge that is refreshing after so many years of playing the traditional format of brick-breaker. The replay value is very good, with high scores recorded so that you can go back to old missions and try to beat your high score, which can then be sent to Game Center. With a fun spy theme and addictive game play, I highly recommend Circuloid to anyone who enjoys smacking a ball around with the goal of destroying everything on the screen. AppSafari review of Circuloid for iPhone was written by Julie Guan on March 22nd, 2011 and categorized under App Store, Fun, Games, Puzzler. Page viewed 3665 times, 3 so far today. Need help on using these apps? Please read the Help Page.